I’ve started the quilting on my Neptune quilt. So far I have spent more time ripping out stitches than I have quilting. It literally takes a minute to put in lots of tiny stitches and hours to pluck them out. (Even when you have a fancy seam ripper.) I just wasn’t liking the design I started with. The design itself is lovely but seemed like a waste of time since it was hardly noticeable on the busy fabrics. It has also been over a month since I quilted last and I could not get loosened up. I was quilting too small for the space so the stitches had to come out (several times.) Finally I gave up and decided that since this is a quilt for me it doesn’t have to be perfect. I could tell by the end of the first row that I was more relaxed and my movements were more fluid. I don’t have a whole lot of quilting time. The baby has been a little sick and the kids are still home. They were supposed to start school on the 6th but there are budget issues and school has been delayed “indefinitely.” The best case scenario is that they might start school on Thursday. Maybe then I can steal more than 15 minutes of quilting time. Until then, I’ll take what I can get. I came here to read your previous post linked from Sew Many Ways. 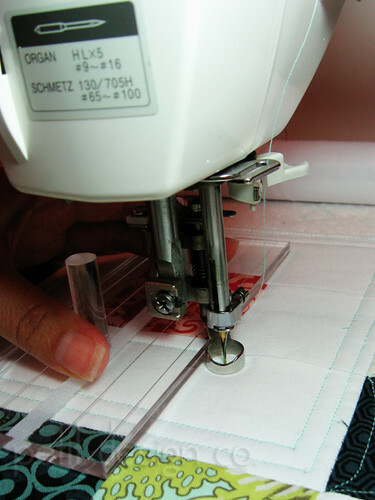 I'm wondering what machine you are using for quilting and if the foot is generic. (Spiders in house--scary ones! Lock-top zippered plastic bags for shoes--the little kids' shoes will fit in a gallon size--bigger ones are available for adult shoes. I bought an electronic machine that sends insects scurrying and have used it for 15 years. They no longer make ones so powerful [at least not that I've found since mine covers several thousand square feet] but Black & Decker makes room size ones. Brown recluse spiders to scare me--one led to the amputation of my grandma's leg.